Hello all, I too have the very same problem with my Scala Q1 and TFT pairing. Everything seems in order except telephone audio is not being sent or received. Phone calls will however create a type of feedback loop that will crash the Bluetooth connection. I have discovered that the Scala Q1 is a 3.0 Bluetooth device. TFT on the other hand seems to be a 4.1 Bluetooth device. (can't find TFT specs anywhere to confirm this theory). TFT users with Sena 20s (also 4.1 Bluetooth) report no such problems. Check out the accessory thread "Connectivity Conn Job" for the full rundown. 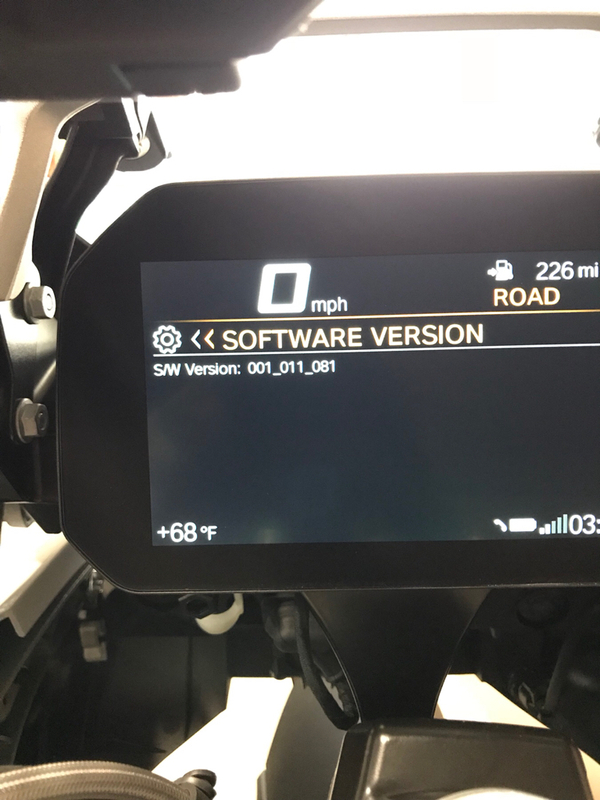 Just a heads up for anyone interested, I picked up my GSA Rallye in late December and have been having the same BT connection issues as others have mentioned - after reading many comments on this and other forums and many discussions with my dealer, I've decided that it's an issue with my Scala Rider Q1 only being BT3.0 and the new BMW TFT display requiring BT4.1 or above to work fully. I have therefore bit the bullet and purchased a Sena 20s and can now confirm that this all works fine with all functions of the TFT with my iPhone (with the exception that the thumb wheel does not operate the volume). I know it's not exactly a solution for everyone with their devices that still don't work but at least its a way forward for those that want to have full connectivity. Both units paired only to the TFT and not to each other. So far the units connect automatically to the TFT when in proximity and all are turned on of course. Definitely can confirm that at present it will not work with the Sena SMH5 or the Scala Rider Q1. BTW -I don't have the BMW Nav so not sure how that works in with any of the above. I am having the same problem with the Cardo G9X, I have tried to connect with all possibilities without success. G9X connect music, navigator and phone but I can not listem or talk. Bad news for me. It looks that I have to replace the Cardo G9X. Let’s wait some software update. I too called Cardo/Scala to see what their take on a possible fix was and they pointed to BMW being the issue in the way they (BMW) deployed the Bluetooth standard which was the underlying problem and not something they (Cardo) could likely fix from their side. Cardo put out an update a few weeks ago right around the time my TFT firmware was updated to v001_014_070 and I was hopeful this combination would get things working as desired/expected....well I was let down and had the same issues still present. I finally bit the bullet (threw $$ at the problem) and bought a Sena 30K so I'd get the Mesh technology that sold me on the Cardo last year initially. I am happy to report I now have a fully functioning setup and have tested having the 30K (v1.0.3) and phone individually paired to the TFT (Sena not paired to phone) and things work as expected/desired with the TFT. I have also tested the Sena paired to the TFT and paired to the phone along with the TFT paired with the phone and it works as expected which also allows me to use the Sena app for added functionality in this configuration. What about siri? i use SENA20S and I would lime to know if you can get siri to work on your sena or TFT? Tried this today as I picked up my 2018 TFT GSA Triple Black this weekend and was seriously struggling to find out why connectivity was so jacked up....followed advice above and things seem to work great. Got an iPhone 5SE with latest SW and a SENA 20S. I had my phone pair to SENA which was throwing the BT connectivity off. Once I deleted SENA 20S pairing to iPhone, everything worked as I've read everywhere it is supposed to. Can stop bike, run into store for an errand, re-start bike and connectivity to SENA from TFT kicks in playing my song exactly where it left off. Access to phone is available as well...man, I'm stoked. dkgruv123 and Bothacp like this. Last edited by HD Convert; 25-May-2018 at 04:23 PM (891). 4. Enabled Siri and can now can 'hey Siri, play Nicki Minaj' or 'hey Siri, call home' with helmet on. 10 hours on a charge. Excellent volume. Noise cancellation reputed to compete with standard earplugs. Best part: 30 day no questions asked returns. Thought this was relevant to OP. If needs a separate OP, please let me know. Last edited by goethe; 19-Jul-2018 at 02:28 PM (811).